Easily installed with custom made brackets, with a load rating of 50kg. 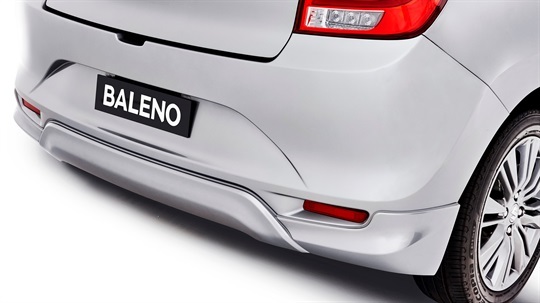 Protector your Baleno's rear bumper from scratches, marks and dents with a durable clear bumper protection film. 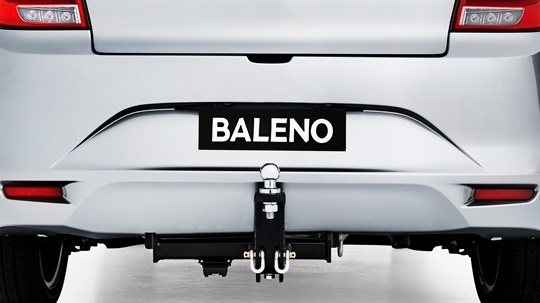 Protector your Baleno's rear bumper from scratches, marks and dents with a durable black bumper protection film. 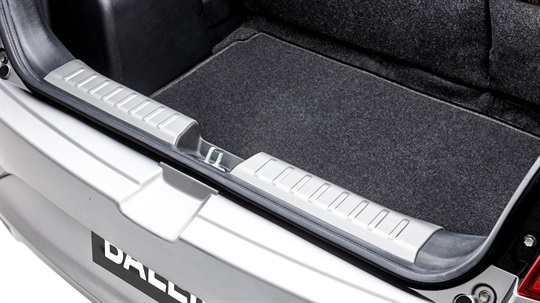 Aluminium to protect the trunk's edge when loading items. 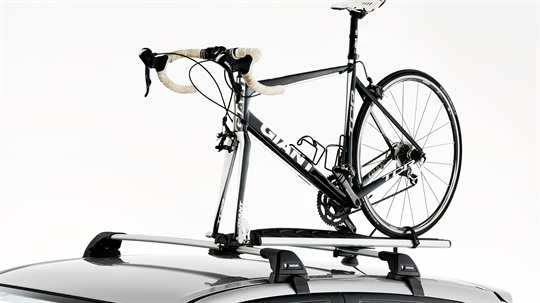 Securely harnesses one bicycle in an upright position. 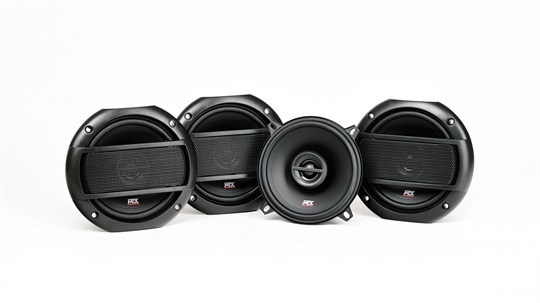 Fully lockable and made from premium alloy. 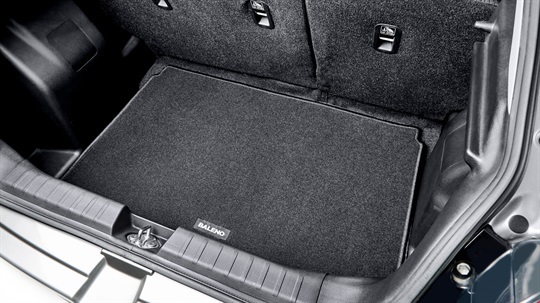 Ideal for carrying skis, snowboards or wake-boards. Soft rubber padding helps prevent damage to the skis. 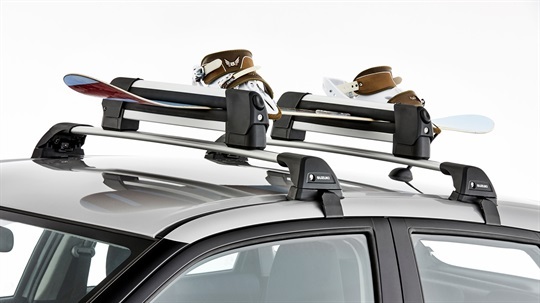 Fully lockable with a maximum carrying capacity of 4 pairs of skis. 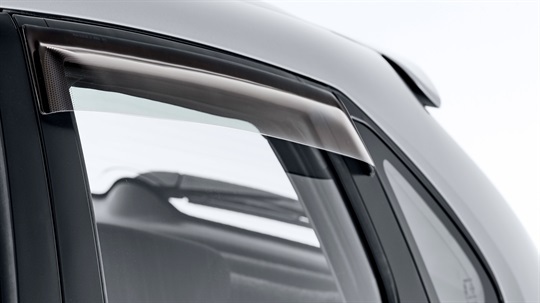 Keep out the wind and rain with durable front window visors. 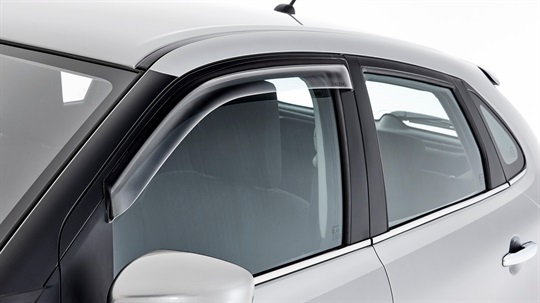 Keep out the wind and rain with durable rear window visors. 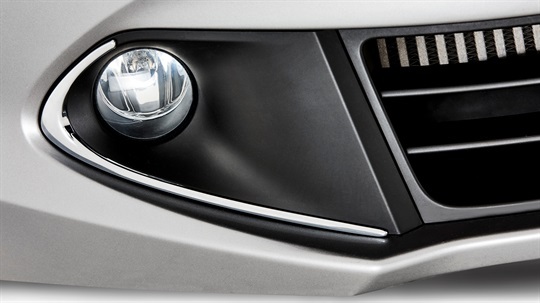 Avoid damage to your front end with this custom-fit clear bonnet protector. 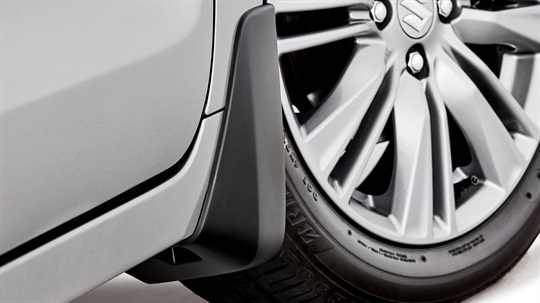 Avoid damage to your front end with this custom-fit dark smoke bonnet protector. 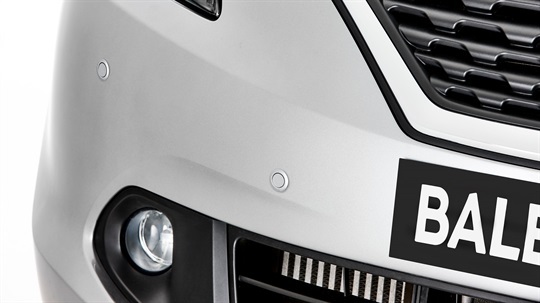 Assists you in judging your vehicle's distance to obstacles when parking or reversing. Sensors are colour coded to vehicle. 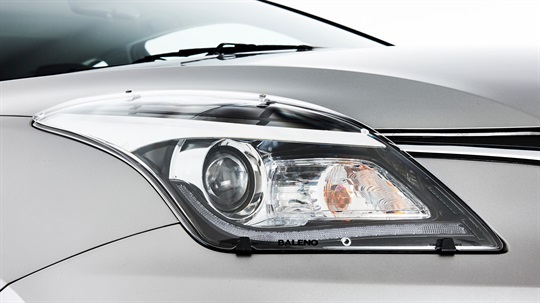 Clear custom-fit headlight protectors that shield your Baleno headlights from damage. Braked 1000kg. Unbraked 400kg. 60kg Downball Rating. 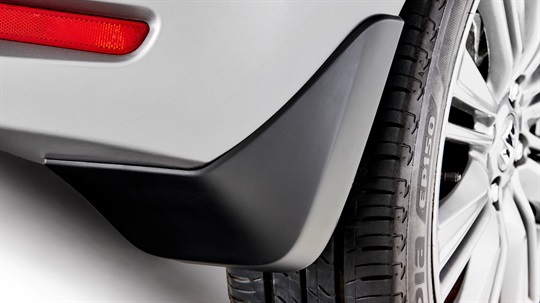 Tow Bar Kit for vehicles fitted with Rear Parking Sensors - 72901-68P10-K02. 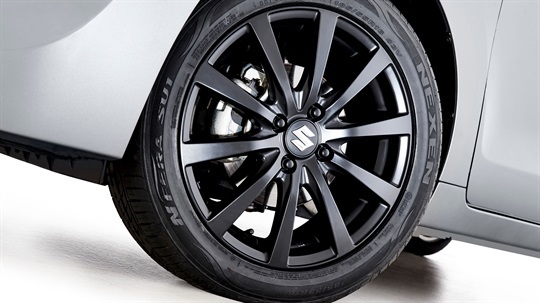 Black Alloy Wheel Set 15"
Give your Baleno some individual Euro style with a set of 4 15 inch Satin Black Alloy Wheels. 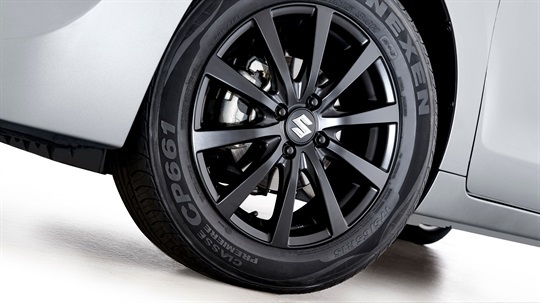 Black Alloy Wheel Set 16"
Give your Baleno some individual Euro style with a set of 4 16 inch Satin Black Alloy Wheels. 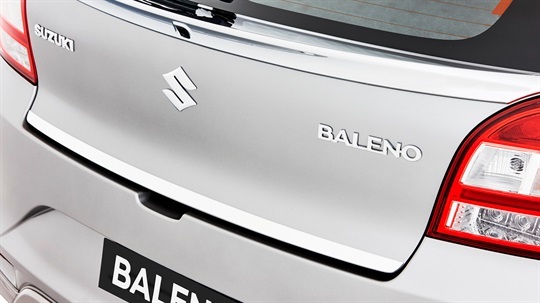 Add the road-hugging look to the Baleno body, the side under spoilers add an exciting look to the Baleno side profile. 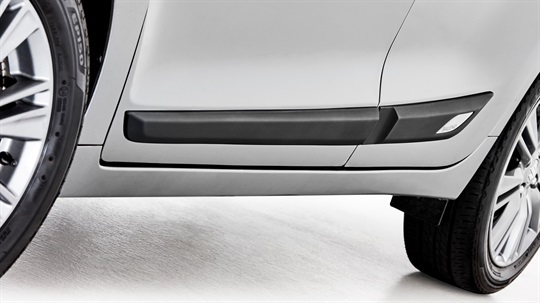 Cannot be fitted in conjunction with rear mud flaps. 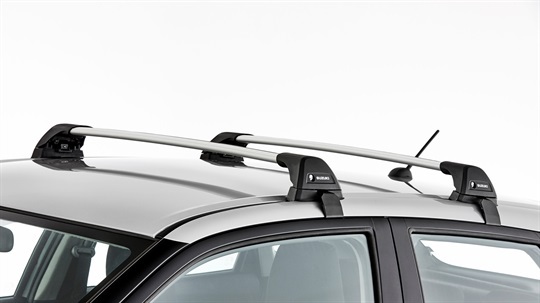 Create that unforgettable profile by adding the Rear Under Spoiler to the underside of the rear bumper. Cannot be fitted in conjunction with rear mud flaps. 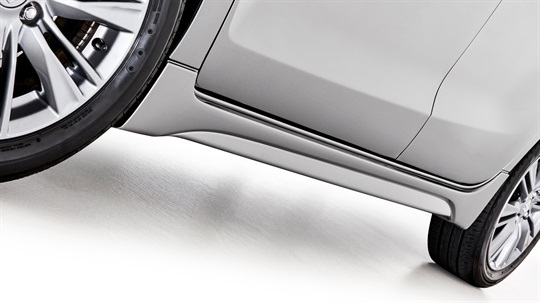 Chromed 2-piece trim set that fits to the fog lamp surrounds. 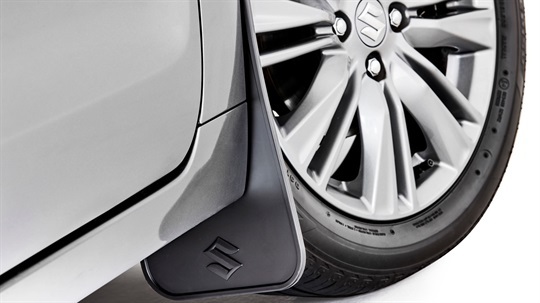 Protect your Baleno from road debris with a pair of front mud flaps. 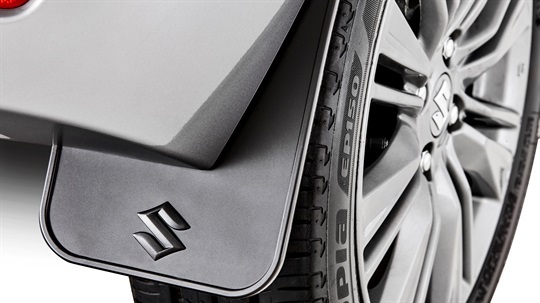 Protect your Baleno from road debris with a pair of rear mud flaps. 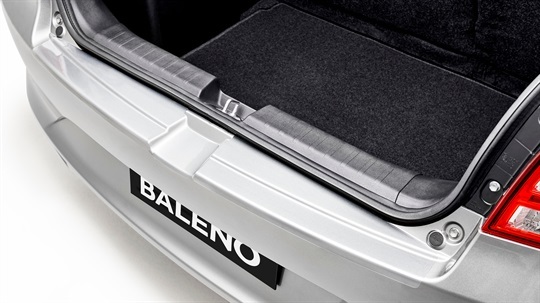 Protect your Baleno's paint work from marks and dents with a set of durable Black Side Body Mouldings. 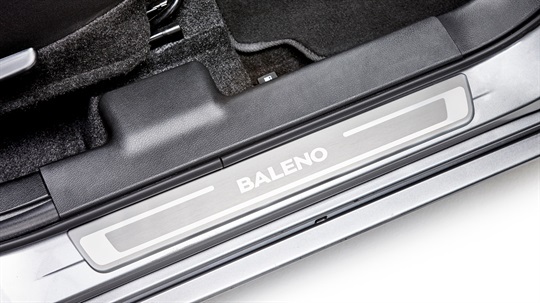 Give your Baleno an individual style with the addition of this chrome finished Rear Hatch Moulding. Four piece set. 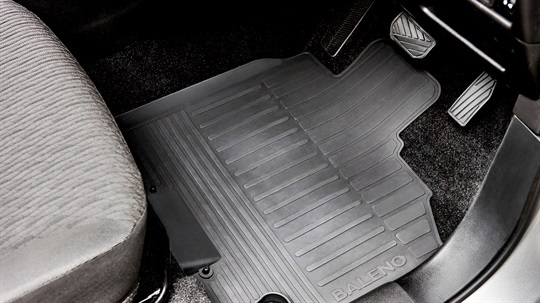 Raised edge to help keep the footwell clean. 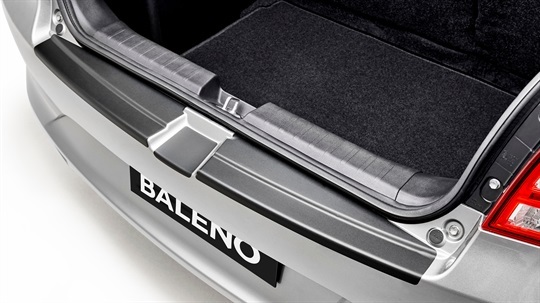 Four piece set of Baleno Door Sill Guards. 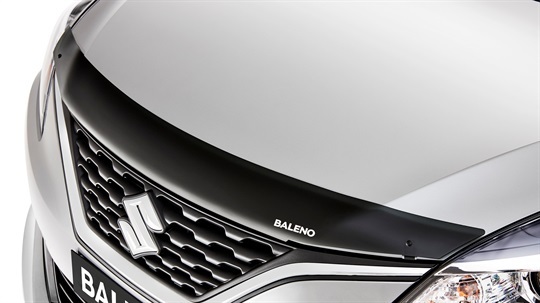 Aluminium brushed design and Baleno branded. 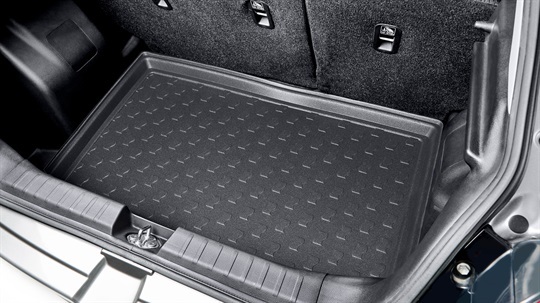 Protect your dashboard with this custom-fit mat. 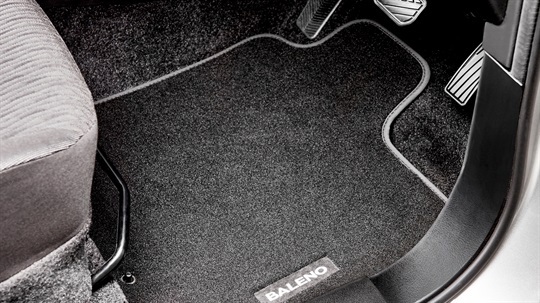 Enhance your Baleno's sound system with the Speaker upgrade kit. 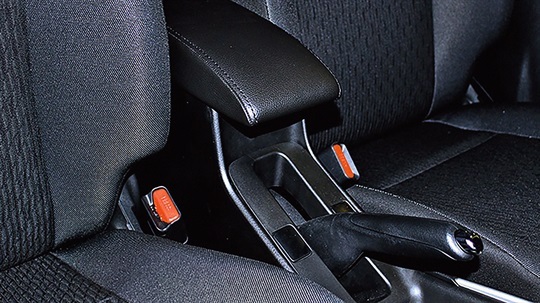 This iPad Holder installs onto your vehicle's headrest in seconds. 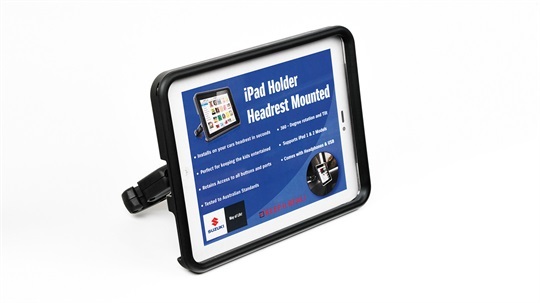 Supports iPad & iPad 2 and iPad (Gen 3 & Gen 4) Models. 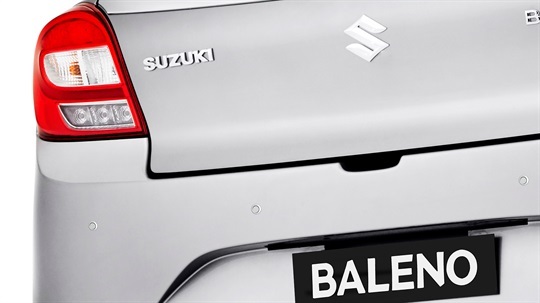 Want to know more about the Suzuki Baleno? 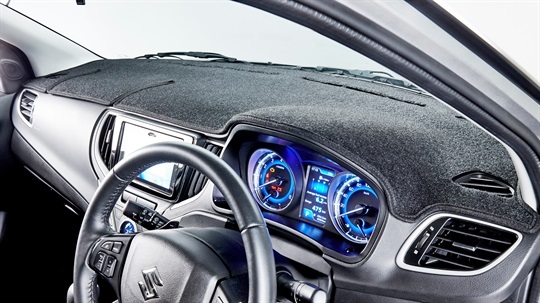 Give the Wangara Suzuki Sales Team a call at Wangara - 08 6446 7337 or Enquire Online. 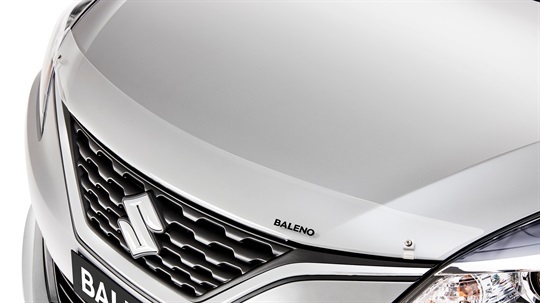 Get the very latest brochure on the Baleno. 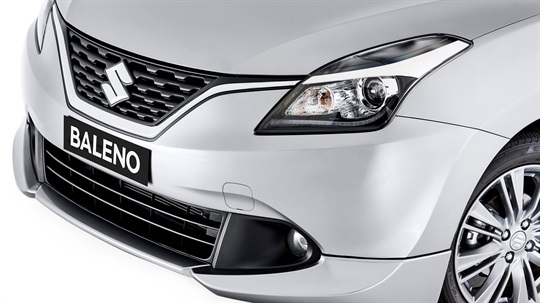 Experience the Baleno, book a test drive online.